SUMMARY: Nine to 14 words. Or perhaps 40 to 50 characters. Depending on who you ask, there are different "golden rules" when it comes to an effective subject line length. In this week's chart, we take a look at an analysis of 9,313,885 emails to discover which subject line length is most effective. Return Path analyzed 9,313,885 emails from more than 3,000 retail senders in February 2015 to see how subject line length affected average read rate. According to Tom Sather, Senior Director of Research, Return Path, "average read rate" is defined as "The percentage of email recipients who have marked your email as 'Read' in their email client [i.e. email reader] — typically thought of as more accurate than open rate, since read rate is not dependent on image downloads." Are shorter subject lines better? When we look at the data, the most frequent length of characters is 41 to 50 characters — 25% of subject lines are this length. This was long thought to be a best practice, as many email readers and browsers tend to cut off subject lines longer than this. Mobile devices can be even more limiting, especially in portrait mode. For example, the Galaxy S4 displays a maximum of 33 characters. 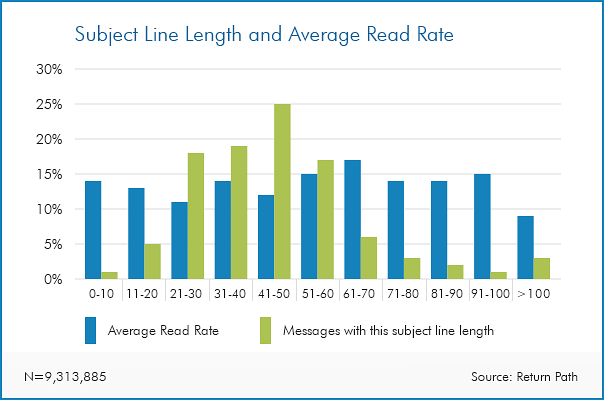 Given how email readers and mobile devices limit character length, you might be surprised to see in the above chart that longer subject lines appear to be more effective. Subject lines of 61 to 70 characters had a 17% average read rate — the highest of any length. Does subject line length matter? Let's not jump to conclusions. While there is variability among the numbers in the above chart, there is not actually a statistically significant difference. According to Return Path's "The Art and Science of Effective Subject Lines" report: "Our research indicates that there is actually no correlation between the length of a subject line and its read rate. When comparing the number of characters in a subject line to the read rate, the Pearson's correlation value was -.03, which shows us that there's no relationship between the number of characters in a subject line and whether or not the email is opened." The differences are likely too small and random at the aggregate level. However, this is at the macro level, and it is only for read rate, not for overall conversion. So, what can we learn from this data? If you have a hypothesis for a longer subject line, give it a chance. Of course, you shouldn't focus your subject line testing only on character count. The main lesson is this: Don't let character count be an artificial limiter to a good treatment. "When testing subject lines, don't focus on how long a subject line is. Don't try to be clever — unless that's an essential part of your brand — and don't be vague. 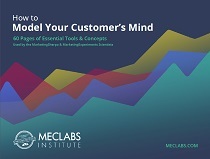 Tell the subscriber in the first few words what's in it for them, create a sense of urgency when possible and tell them exactly what they should do," Sather said. "Always test. Don't trust your gut, or anyone else's," he concluded. Email Marketing and Copywriting: Why you should send "spam"